This week at the Muses the theme is PLANTS AND/OR INSECTS. Background: is a blend of three of my own photos; blue butterfly: Studio Manu; orange butterfly wings: Createwing Designs; ladybugs: pngimg and pngpix; texture: pareeerica. 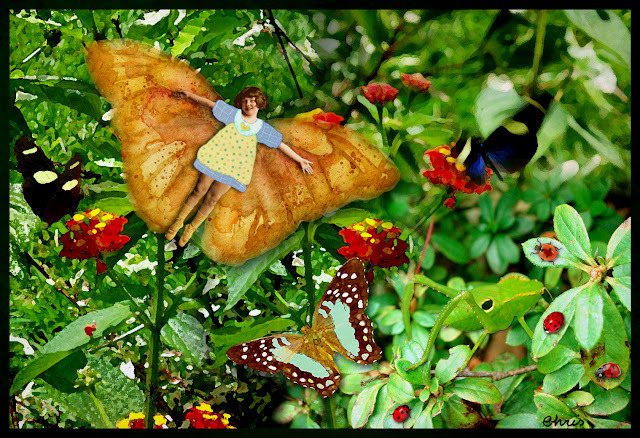 I do love your butterfly girl, Christine, lovely photos! Wonderful colours, a superb design and great use of your own photos. All together the elements make a most beautiful picture. WOW wonderful composition liek a fairy tale. Whimsical fun, colorful and clever! Oh the whimsey... I love this what a delightful view of the garden. A fantasy garden so beautiful!! A scrumptious and most whimsical garden, Chris.